I love sharks. Love them. I do not love Shark Week. In honor of the Discovery Channel re-airing its Shark Week, I re-offer my examination of TV’s most prestigious week. Oh, you have not read it before. So, why do I think Shark Week on The Discovery Channel is just so, so ridiculous? Did you know that sharks have 6 senses, instead of 5? Yeah, well, you wouldn’t be thinking about that when their teeth slice through your rib cage like 50 Ginsu knives! Then, over on the dessert table we put – Oh, Jesus, it’s like they don’t even care that they obviously look like little people! “Now, in order to get a sense of how humans eat, we’ve made this meatloaf in the shape of a smiley face. Next, we put it in the buffet at Izzy’s at the start of the dinner rush. Let’s watch what happens… okay, a few of them have bumped it… they’re curious; checking it out… someone’s taken it! They’re eating it! They’re eating the face! Oh, lord, this is horrifying! Look at him eat the face! If that was your face that would definitely be fatal! Your face would totally be getting eaten by that guy! OH GOD, he’s eating the little meatball eye we put in the face! Truly, it reveals the cold savagery of humans that one would eat something made of food that vaguely resembles its own species! It’s own species! ← It’s The Weekly Question of the Week… IN SPACE! oh yeah and AHHHHH! We’re all doomed I tells ya! oh the humanity, oh the sharkanity! See, a lot of people forget the second “AHHHHHH!” Well done. Not to backtrack or be an apologist, but I’ve only actually seen little bits of Shark Week. I love sharks and am utterly fascinated by them to the point of considering starting a shark-worshipping cult (application are available! ), so I’ve watched bits of Shark Week first as genuine interest, then disdain, then mocking belittlement. I would “Like” this, but that seems inappropriate because I love it! I especially appreciate the shark/Himalayan snow leopard attack comparison. I wish statistics like that were used exclusively in humorous posts, with the latter part not whispered! * These bags are shoved in your face as you’re walking. I’ve never actually watched Shark Week in whole or part. Shark Week bags at Comic-Con? I can see Giant Shark vs. Mega-Octopus at a comic-con, but just Shark Week? Yep! Crazier’n Shark Week itself, if you ask me! And that movie title? Sounds like a SyFy original movie to me! Oops, I meant Mega-Shark vs. Giant Octopus. Boy do I feel silly – the title I said is ridiculous! The real one was straight to dvd. Wouldn’t a “mocking belittlement” week be chock full full of chewy-gooey awesomeness? Not to be contrary (Get it? Contrary? Get it? You totally get it. ) but I think Shark Week is some of the best television all year. It doesn’t make me scared of sharks at all- it makes me want to be a shark. I think you’re missing the point of shark week, which is clearly that sharks are awesome but when you put music to videos of sharks they become totally freaking awesome. Pretty much everything makes me want to be a shark (because of the awesomeness). And I suspect in the wild sharks hum their own music to enhance their bad-assness. Ohhhh! “Contrary”! I just got that. So, those thousands of sharks who marched in the 1960s and sacrificed so much for their cartilage-skeletoned brethren don’t even deserve a week of their own? You must be from Arizona. I just read an article in the current Outside magazine about the rise of shark attacks. There is great controversy regarding the chumming of the waters to get old sharkey to come and scare the crap out of tourists in a cage. The point I like the most was that we don’t go to Africa and throw out a carcass in order to attract a lion, tiger or bear, OH MY! (sorry) But we do that to the fiercest, oldest damn predator in the ocean. Stupidheads. Oh and by the way, the locals here call sharkey The Man In The Grey Suit. Respect! Just got back from Australia. I said something was “shocking” while I was there. Between my accent and their preoccupation with sharks, the Aussie I was speaking to thought I said, “sharking” and asked if that was an American expression. Apparently they think our Shark Week obsession has led to stupid expressions as well. Good on ya, dumb Americans! That’s actually not a bad expression. If something was overpoweringly cool, it’s “Sharkish”. “Sharky”. “Sharking”. No, they all sound dumb. Never mind. That’s a funny story , though. I would never have guessed shark to the the animal with a sixth sense. I was thinking more, maybe the owls. The just sit there waiting for something, like they know its happening, like they’re psychic. Apparently they can basically feel the electro-magnetic energy that others beings give off. There’s really cool video of it in action. Like a digger fish burrows in to the sea floor, covers itself up. A little later a shark comes swimming by, passes by the spot – whoop, hold up! – whips around and chomps in to the ground, bad day for the digger fish. I too can feel the electro-magnetic energy that other beings give off. Sometimes it’s cool, but other times, it’s just a headache. I’m constantly having to re-Gauss my video screens and don’t get me started about airport security. Sharks can sense my sixth sense and give me a wide berth in the briny deep. Jellyfish are nowhere near as polite. I’ll have to show this to my son. He recently caught a 4 1/2 foot brown shark on the NJ surf. He is actually holding it with his hands for a photo shoot. 3 girls asked him if they could take a picture with him and he got 2 phone numbers. So, in his 17 year old world..Sharks Rock! Don’t worry he thanked the shark over and over before he put him back. They had an understanding..I’ll get you some girls, you put me back…capiche. I think it should be a law that if you have contact with a shark in the wild – in any way – that 2-3 people have to flirt with you. I’ll get the petition ready! I was watching it last night when they were throwing in the rubber seal to get it to attack and I was thinking that must piss them off real bad. They think their getting a yummy seal treat and lo and behold it’s a wetsuit. Blech. I suppose they’re happy about all the chum being thrown to them, but after that it’s all tease. I saw a segment once in which they made a fake shark out of fiberglass (or something), and put dead fish and blood in it to see if sharks would eat it. It did, which on ONE hand might show that sight is not a dominant sense for sharks, which would seem obvious. On the OTHER hand, though, it might prove that SHARKS ARE WILLING TO EAT OTHER SHARKS. THEY JUST DON’T EVEN CARE. I remember seeing Jaws for the first time. When that great white first raised its ugly head, I put my knee through the theater seat ahead of me! Isn’t it weird that because the mechanical shark malfunctioned and Spielberg had to improvise (seeing things from the sharks point of view, etc. ), that ever since we’ve got hundreds of movies where you don’t see the monster/villain until the end? That is lame! I think we should protest. Yah! Let’s make some signs and march on Hollywood. While watching Shark Week I saw a few statistics along the bottom of the screen that seem to prove that even Shark Week isn’t taking its campaign of terror very seriously anymore. One staistic was along the lines of in 2006, 26,000 people were harmed by air fresheners and 43,000 people were harmed by toilets, while only 25 people were harmed by sharks. Coming this Fall: AIR FRESHENER WEEK. How do you get harmed by an air freshener? Interesting. My dad told me a joke about sharks this weekend & I assure you, he doesn’t know it’s Shark Week. I wouldn’t have if not for you! If made a pizza in the shape of a doe-eyed kitten, I would eat that pizza. Happily. With no remorse. I’m with the sharks on this one. I’m only one paragraph in but I already “liked” this. . . . I’ll be back. Reading from work: the sharks are circling. Oh, work sharks are the most dangerous. 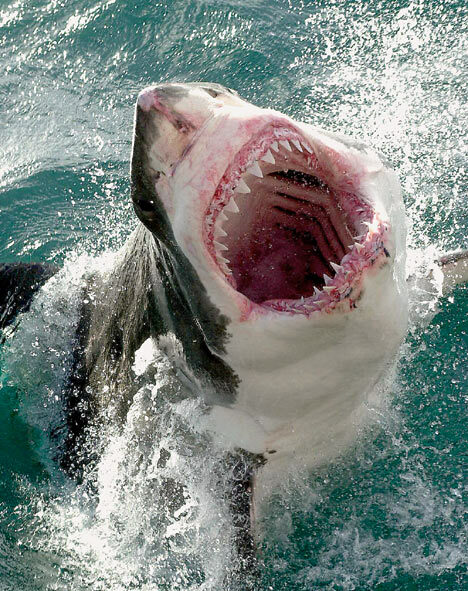 Great whites only attack out of hunger. I don’t watch much of the Shark Week events on Discovery Channel (“Shark Week” means something different around my household), but I STILL have “cage dive with Great Whites” on my Bucket List. They can’t scare me!!! Me too. Although I’m curious if it’s possible to hyperventilate in a scuba tank. Shark Week teaches us all the importance of not impersonating a seal and jumping around making seal noises….regardless of if you live in Colorado far away from any sharks. Better safe than sorry. Nobody’s going to tell me when I can and can’t play “wounded seal” in the ocean, by gar! If they ever knew what we were doing to the oceans, shark, whale and squid attacks would go up about a billion percent. Give or take. I love Shark Week and I don’t care what you say. You cannot take my Shark Week away from me. They’re ginormous, most humans never see one, they have razor-sharp teeth in rows and their entire faces retract when they open wide. Awesomesauce. Oh man. I will never feel the same about eating those delicious scrumptious gingerbread men again! Thanks a lot, B. Thanks for ruining Christmas for me. What a scrooge! Did you see the story of the guy who was rescued after his boat sank and when they showed the video of him treading water, they pulled back and you could see like 20 dark shapes in the water all around him. For some strange reason, though, he was not eaten. Maybe they were just full from eating the OTHER guy who was in the boat with them. Yeah, that’s probably it. I love sharks. I root for the shark in those documentaries. I also root for the bull if ever I’m forced to watch bull riding or similar nonsense. When I hear about things like “bear-baiting” I root for poorly-made bear chains. Oh, but I see that you DO love them. It can be our secret. That’s what you actually wanted to do, isn’t it? 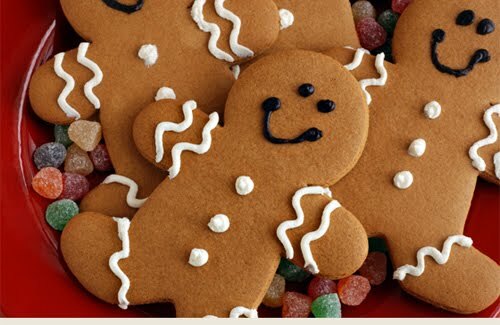 Am I a bad person because your post made me crave gingerbread men? For making me laugh every time I come on your blog, I have nominated you for the Very Inspiring Blogger Award. Since you have probably done this many times before, you can just reply to this comment with a link to the last time you did it.